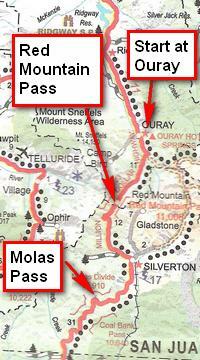 A beautiful and easy ride starts at Ouray and traverses the Million Dollar Highway through Silverton and to Molas Pass. The scan is from the official Colorado highway map. I’ve been hitting the dirtbike hard this year, looking for any and every opportunity to get out. The past couple days has blessed us with good, albeit windy, weather. Yesterday I had the pleasure of running into Glenn Neigenfind. We rode together up Ouray County Road 4 and also up as far as we could make it toward Buckhorn Lakes. I had a dirtbike ride set for today, but my riding partner had scheduling complications. Rather than explore some far nook by myself, I thought I might try my 15-year-old Yamaha Seca II 600cc in-line 4 sport-touring bike. (I’m the original owner.) It took some coaxing to persuade the engine to fire—after all I only took it out twice last year. But with some prudent battery charging the thing finally kicked to life. I will say that it ran terribly for the first ten miles or so, not quite seeming to fire on all cylinders, but by the time I reached Ouray it was its usual purring self. The origin of the Million Dollar Highway’s name is lost to history; the consensus is that it comes from the million-dollar view. The nicely paved and well-maintained road, U.S. Highway 550, ramps south of Ouray following the canyon of the Uncompahgre River. With lots of sheer cliffs, shelf roads with no guard rails, constant danger of falling rocks, and sharp turns, it’s a motorcyclist’s delight! I was pleased to find there was little traffic. I only had to pass one or two cars; many saw my headlight in their mirror and moved out of the way (bravo for Colorado drivers!). For long stretches of road I was the only vehicle. At times I’d slow down to drink in the scenery and others I’d enjoy the corners. At the Red Mountain Mining District overlook. I stopped at the Red Mountain Mining District overlook and asked someone to take my picture. This is the mining district that hosts the famous Yankee Girl Mine. County Road 31, which provides access to the mining district, has already been plowed. I suspect it’s a muddy mess—I didn’t look. The map inset at the top shows the route as it wiggles its way south of Ouray to Red Mountain Pass at just a titch over 11,000 feet above sea level. From there it winds down a steep shelf road to Chattanooga (only a ghost town now) and thence to Silverton via some easy sweepers. The pavement is in excellent shape and is dry and mostly clean. That's the engine for the Durango and Silverton Narrow Gauge Railroad. There are several trips a day starting in Durango. Silverton, of course, is the northern terminus of the Durango and Silverton Narrow Gauge Railroad. 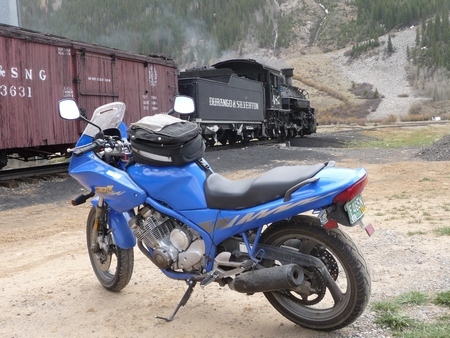 I include a photo of my bike and their steam engine. I suspect their engine has much more power than mine, but I can guarantee I can go faster! I headed south of Silverton, ramping back up via both sweepers and sharp corners, turning around at Molas Pass. The fun stuff actually continues further south all the way to Durango Mountain Resort (which used to be called Purgatory—a much better name!). I’ll mention here my single Harley-Davidson-branded possession: a wonderful and very warm electric vest. Too cold at altitude? Just flip the switch…aaahhhhh! The Million Dollar Highway is part of a loop that makes for a great day trip. Start at Ouray and follow U.S. Highway 550 to Durango. Then head west on U.S. Highway 160 to Mancos. From there head north on Colorado 184 to Dolores, then up Colorado 145 to Telluride and then Placerville. From there, Colorado 62 takes you to Ridgway where you once again meet U.S. Highway 550. It’s only ten miles from there to Ouray. Mark this route for the fall color season (end of September) for spectacular color. 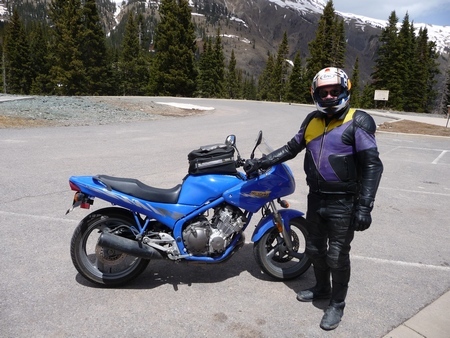 This entry was posted in Motorcycling, Ouray County. Bookmark the permalink.